The Weekly ETF SPY usually highlights how to make breakouts work for you, but this week’s ETF SPY is about how to avoid getting burned by fake breakouts, fake breakdowns, or as I’d like to call them, fake out breakouts. Trend line breakouts or breakdowns confirm a change of trend (at least temporarily) about 70% of the time. 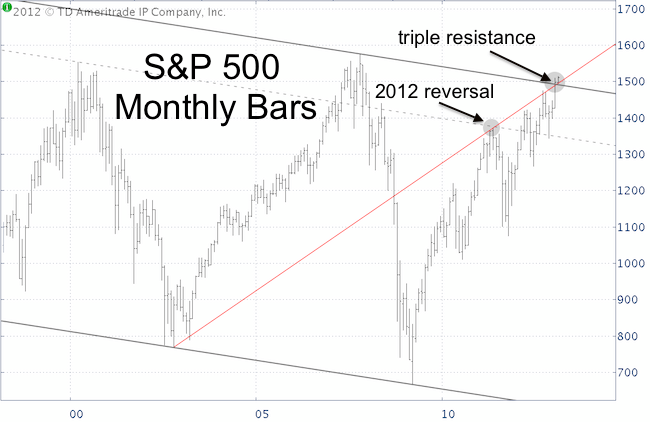 We’ve used such trend line breaks to identify deeper corrections in 2010 and 2011. However, not all breakdowns are equal. Certain patterns are notorious for creating fake out breakouts. If you are familiar with Elliott Wave Theory (EWT), you know that markets move either in 5 (trending) or 3 (counter trend) waves. Within the 5-wave pattern, waves 4 have a reputation for zigzagging above all kinds of support/resistance levels. The February 3, Profit Radar Report featured a complete forecast for the year 2013 (based on technical analysis, seasonality and sentiment). Directly ahead, at least based on my analysis, was a wave 4 correction. It’s too early to tell if we are in a fourth wave, but we were prepared for fake out breakouts. 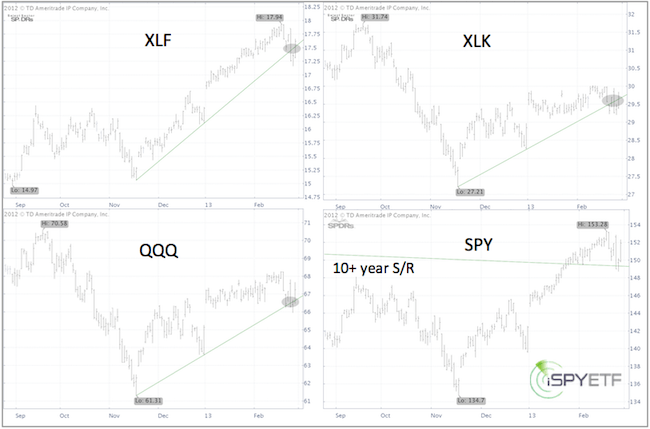 The chart below shows false breakdowns for four key ETFs: XLF, XLK, QQQ and SPY. All four break below support, but we didn’t use it as a sell signal. Quite to the contrary, we used the 10+ year support/resistance line for the SPY ETF as a stop-loss for short positions and closed our short positions at S&P 1,491. In summary, trend line breaks are one of my favorite indictors, but they must be viewed in context. If you don’t open your eyes to the bigger picture, you open your portfolio to bigger losses. On Monday the Dow spiked within 120 points of a new all-time high before falling hard. In fact, Monday’s red candle engulfs all of the 21 previous candles. However, the bearish candle is in conflict with bullish short-term indicators. The Dow Jones Industrial Average (DJIA) reversed trends with an exclamation mark on Monday. After spiking to a new recovery high, the DJIA (corresponding ETF: Dow Diamonds – DIA) fell to a 21-day low. A chart simply and elegantly displays a ‘bad day’ like this with a big red candle. This one red candle engulfs the 21 previous candles (shaded gray box). This red candle high is also called a reversal candle. Candles like it tend to mark trend reversals. In this case from up to down. This doesn’t mean the Dow can’t and won’t eventually move higher (short-term bullish developments discussed below), but it cautions of lower lows ahead. Two other facts enhance the message of this red candle. The high occurred right against a parallel channel anchored by the June/November 2012 lows and September 2012 high. Perhaps even more importantly, the Dow stalled and reversed just before its all-time high water mark at 14,198.10. The Dow’s all-time high is huge resistance. At the Profit Radar Report we call this kind of a trade a low-risk trade. Why? Because we were only 200 points or 1.5% away from the stop-loss level. But one swallow doesn’t make a summer one one red candle doesn’t make a bear market. After two 90% down days (February 20, 25) stocks were likely to rally. That’s why Monday’s (February 25) Profit Radar Report recommended to cover short positions at S&P 1,491. In addition the VIX triggered a sell signal (buy signal for stocks) yesterday. Although I think that stocks will slide to a lower low, it will take a break below support or a spike to resistance to place a possible short bet. Important short-term support/resistance levels are outlined in the Profit Radar Report. There are many reasons why stocks tumbled on Monday, but one cause was largely ignored by the media. This ‘hidden’ sign of distribution resulted in a 10% drop the last time it occurred. 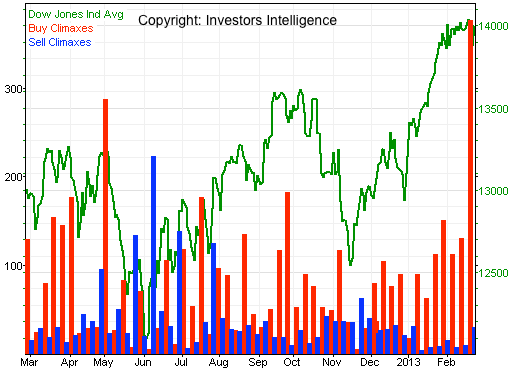 On February 13 we took a look at stock buying climaxes as published by Investors Intelligence. At the time we saw three consecutive +100 readings. Buying climaxes happen when stocks are moving from strong hands to weak hands. They are a sign of distribution. A buying climax occurs when a stock makes a 12-month high, but closes the week with a loss. Last week the S&P 500 and the SPDR S&P 500 ETF (SPY) recorded their very own buying climaxes as they recorded new recovery highs, followed by a weekly red candle. This was a bearish sign. In addition to the weekly red candle, there was a big red daily reversal candle on February 20. The February 24 Profit Radar Report referred to this reversal candle and stated: “The big red February 20 reversal candle cautions that this rally (referring to Friday’s bounce) may be just part of a counter trend bounce” likely to “test trend line resistance at 1,519/1,525. The accompanying recommendation was to let the rally play out but short the S&P 500 once it breaks below support at 1,514. Not only did the S&P break below 1,514, Monday’s data also shows that 376 stocks recorded buying climaxes last week. Buying climaxes are just one of the many data points monitored by the Profit Radar Report. Technical analysis, sentiment readings, VIX, and S&P 500 seasonality, are used to identify low-risk trade setups. Weekly ETF SPY: Is The VIX Already Stretched Too Far? The VIX has rallied more than 30% in 2 days. This VIX move is in harmony with VIX seasonality. How much up side potential is left after such a huge move and what are the odds of further gains? On February 14, we took a closer look at VIX seasonality. The featured VIX seasonality chart is one of the most unique VIX research tools. It predicted a VIX spike in late February. From low to high the VIX jumped 31.57% the last two days (Tuesday – Thursday). Now what? Yesterday’s strong follow through pushed the VIX above the upper Bollinger Band. A close above the upper Bollinger Band is generally an indication of an overbought condition. Obviously the tight VIX trading range has compressed the Bollinger Bands and narrowed the spread between the upper and lower band. This may lessen the effect of this signal, but it shouldn’t be ignored. 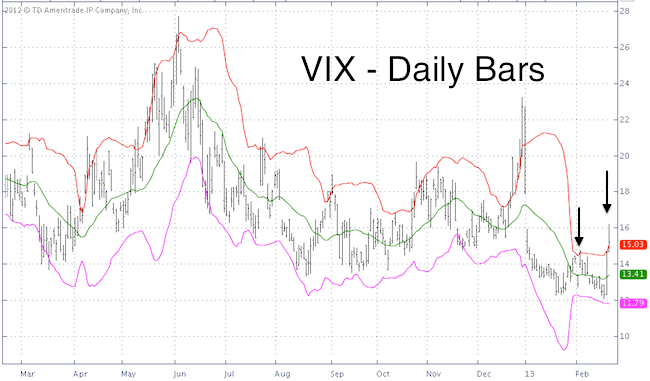 On February 4, the VIX also closed above the upper Bollinger Band (black arrow on the chart). The VIX was back below it the next day and the S&P closed at 1,511. The close below the upper Bollinger Band was a VIX sell signal (buy signal for stocks). From there on the VIX almost declined 10% while the S&P 500 rallied as much as 20 points. Yes, those aren’t huge moves, but small trading profits pile up too over time. More importantly, the Bollinger Band provides a stop-loss guideline for VIX long position (i.e. VIX calls or VIX ETFs like VXX or TVIX). How so? A close back below the upper Bollinger Band usually means that the VIX spike is ready to pause (or already over). It might be time to ‘eat your ice cream before it melts.’ In other words, lock in gains. In rare instances the VIX will “climb up the Bollinger Band” (an expression coined by one of my subscribers). This usually coincides with a waterfall decline in equities. Unless the major averages drop below nearby key support, such an event is rather unlikely. Up until yesterday, the market has been stuck in a tight trading range for over a week. A look at the past shows that periods of such sideways trading generally lead to a spike higher. Last week’s trading range (from February 11 – 15) was a whopping 11 points for the S&P 500. A candle chart visually expresses this performance with 5 candles called dojis. What exactly is a doji and what does it mean for the market? A doji candle is formed when the open and close are the same or very close to equal. 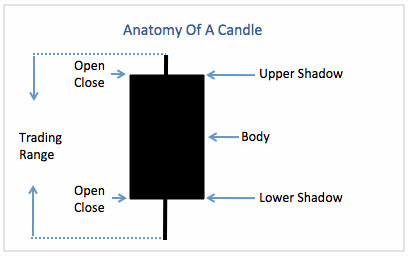 The body (see “Anatomy of a Candle” chart) is narrow. 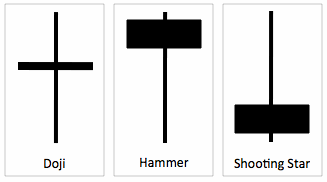 The upper and lower shadows vary depending on the type of doji (see second chart). All doji candles reflect a measure of equality between buyers and sellers and a period of indecision. “The market usually doesn’t give investors a whole lot of time to make the right decision (i.e. get out at the top), that’s why a cluster of dojis is rarely seen at significant highs. The candle chart below highlights various doji clusters. Most of them (gray boxes) were followed by spikes higher. The red box, although not a ‘doji top,’ is one possible exception. Dojis tend to relieve overbought (or oversold) conditions and tend to provide more fuel for the next move. The Profit Radar Report is putting the dojis in short-term context with nearby support/resistance levels and in long-term context with an extensive 2013 market forecast. A smart person learns from his mistakes, but a truly wise person learns from the mistakes of others. There is no such thing as a truly wise investor, but learning from my mistake may make you smarter. We all have our fears and we all need to face them eventually. My fear as a stock market analyst and forecaster is being wrong. Unfortunately, that happens more often than I’d like it to be. Still, I just can’t get used to that feeling. Every time the market outsmarts me, I analyze what happened. This analysis benefits me – as I try to reduce the amount of future ‘wrongs’ and increase the amount of ‘rights’ – and I thought it might benefit you. So here’s my latest slip up along with the ‘post game’ analysis. In late January triple resistance converged at 1,492. The chart below shows two of the three resistance levels (the third was a 70-day trend channel, not shown because it doesn’t display well on the monthly chart). The red trend line connects the 2002 low and 2011 high. The gray line is a parallel channel that connects the 2002 and 2009 low with the 2007 high. One resistance line is often enough to stop an advance, but triple resistance is pretty solid (at least so I thought). Additionally, I ‘had faith’ in the repelling ability of the 10+ year parallel channel, because a very similar channel (dashed gray line: 2002 and 2009 low connected with the 2000 high) repelled the S&P in 2011 and caused a 20% decline. But nothing trumps price action, and regardless of the rhetoric, the S&P went higher. This was consistent with prior comments, made at a time when Wall Street, the media, and investors were bearish (partially because of the fiscal cliff). The move above 1,492 unlocked my ‘alternate’ target range of 1,515 – 1,530. 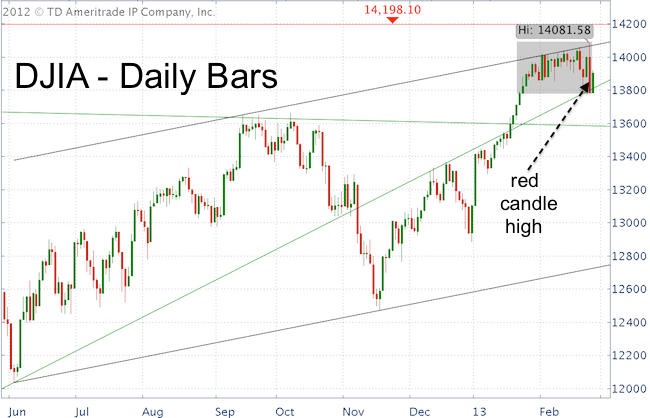 The S&P has stalled here, in fact five daily doji candles last week reflect indecision. But indecision doesn’t have to be bearish. It will take a break below nearby support to unlock the potential for a somewhat deeper correction. What’s the key lesson? An up market, especially in a QE world, should get the benefit of the doubt until momentum is broken. Instead of using technical analysis to pinpoint a reversal range, I should have followed the trend and focused on support levels, that – once broken – confirm a turn around. 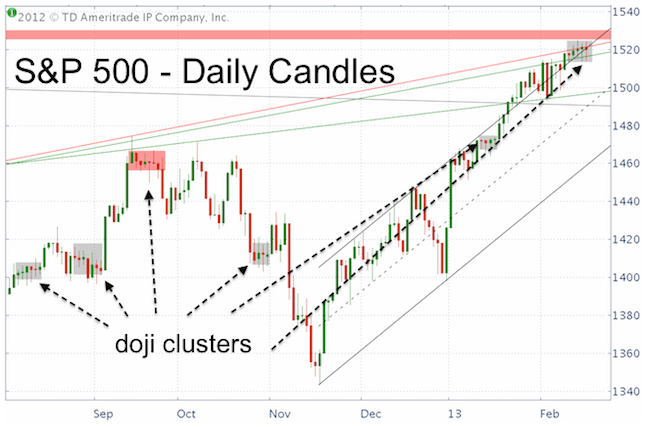 The meaning of the recent string of doji candlesticks along with a comprehensive 2013 forecast is available via the Profit Strategy Newsletter. Weekly ETF SPY: China ETF At Support – Buying Opportunity? After breaking out, the FXI China ETF has consolidated and come back to test support. Is FXI’s return to support a buying opportunity or a warning sign? Technical indicators suggest an ultimately bullish solution. China has been an ongoing theme here at iSPYETF.com. The October 11, 2012 article “Contrarian Investment Idea: China ETF Looks so Bad, is it a Buy?” recommended to buy iShares FTSE China 25 ETF (FXI) with a breakout above 36.50. 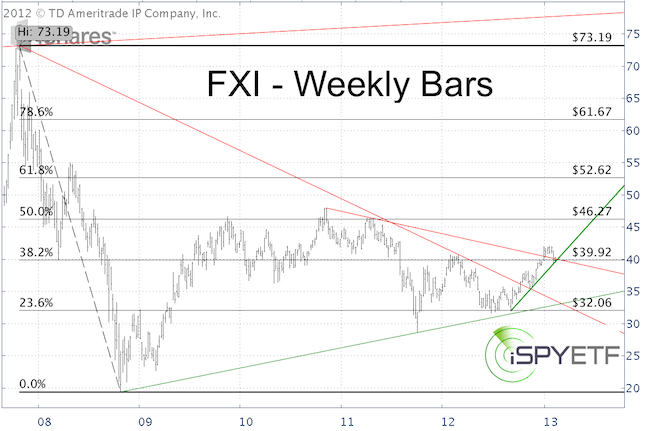 Since then FXI rallied as much as 15% and just recently pulled back to test trend line support (see first chart). Over the long-term, Chinese stocks have a lot more up side potential and buy-and hold investors might be better off simply holding on to a long China position. If you are interested in short-term profit management, the bold green trend line is of interest. This trend line has acted as support since September 2011. 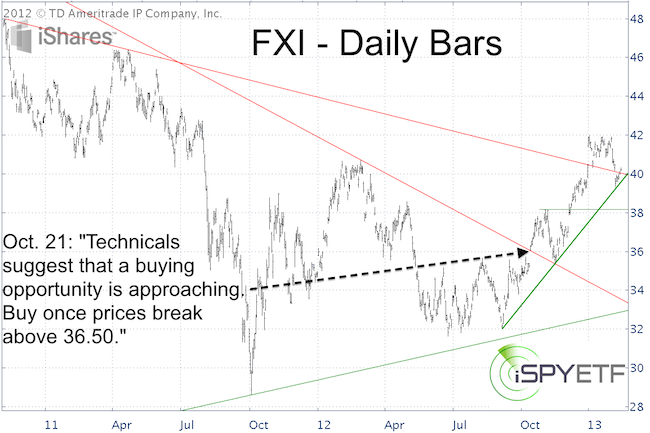 FXI’s up trend is alive and well as long as prices remain above it. However, the trend line is ascending at a trajectory steep enough to validate an eventual break below. Additional support is provided by the horizontal green line around 38. The second chart provides common Fibonacci retracement levels and additional longer-term support resistance levels. Based on Fibonacci’s wisdom, 39.92 is a support/resistance level to be watched as well. Bottom line, as long as prices remain above 38 +/- the trend for FXI is up.